Anand played three black games in first five rounds and now he will have three white games in the last five which gives him a real chance to catch up and even go past tournament leader Fabiano Caruana of Italy. World Champion Viswanathan Anand will take on Michael Adams of England in the opening round of the second half of Grenke Chess Classic here. A missed opportunity, an excellent grind and few expected draws has been the story thus far for Anand and the Indian ace has every reason to look at the remaining games with optimism. It was only the day before the lone rest day that Anand was able to secure a victory at the expense of Arkadij Naiditsch of Germany. In four draws before that, Anand had missed on a winning opportunity against Daniel Fridman of Germany while the other games did not give him many chances. The Italian has recovered pretty well after a dismal show at last month's Tata Steel Chess tournament. With 3.5 points in his bag Caruana leads the standings ahead of Anand who has half point more than Naiditsch and Fridman. Adams is on two points from five games while Georg Meier of Germany is at the bottom of the standings with 1.5 points. 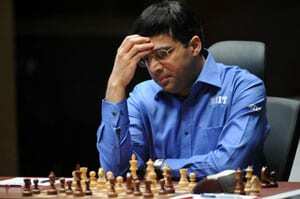 The stage is set for a nail-biting finish if Anand continues in the same vein. The Indian has been in fine form recently and the game against Adams will be crucial to determine the eventual outcome in the tournament. It may be recalled that Adams had scored a rare victory against Anand in the London Chess Classic last December and now comes the opportunity for the latter to avenge the defeat. Caruana is leading but has also had his share of luck. He has already survived a couple of dangerous situations and with three black games remaining, the 'safety-first' approach might already be doing the rounds in the mind of the young Italian. Naiditsch has been the most uncompromising player in the tournament and has produced as many as four decisive games. Against Caruana he got an excellent opening but messed it up while against Anand he was no-match. His victories over Meier and Adams were excellent and the German showed his real skills in those two games. If the tide turns his way, Naiditsch can be a dangerous opponent for the leaders. Fridman is the only player who has drawn all his games that signifies solidity in his approach against high class opposition. However, the draws don't normally help in tournament success and it is unlikely that he will be a threat to both Anand and Caruana. Adams and Meier will first have to come to a 50 per cent score and only then these two can chart out their plans in the tournament. Overall, it looks a straight dash to the finish between Caruana and Anand and despite a half point deficit the scale is slightly tilted in favour of the latter to win his first Classical tournament after a long time.